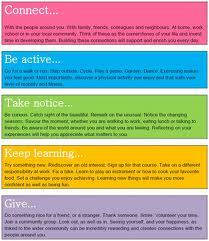 The Five Ways to Well-being – five evidence based positive actions for promoting personal well-being and happiness. The UK Government Office of Science from time to time conducts what they call “Foresight Reviews” of issues that are pertinent to the future of the UK. In 2008 their focus was people’s well-being and we at nef´s centre for well-being were commissioned to produce a list of positive actions that would enhance people’s well-being. They had to target the individual, be universally applicable and of course they had to be evidence based. The whole Foresight project was a massive endeavor and it involved over 300 experts and contained over 100 separately commissioned reports and reviews. Our positive actions project started just as all the other reports were being collated, so we could use them as our primary source of evidence. Five action themes were identified that met the criteria as well having the quality of variety: social relationships, physical activity, awareness, learning, and giving. The Five Ways have had significant pick up in the UK since the Foresight launch in late 2008 and internationally since the TED lecture and the subsequent publication of the book – The Happiness Manifesto – by nef´s Nic Marks.